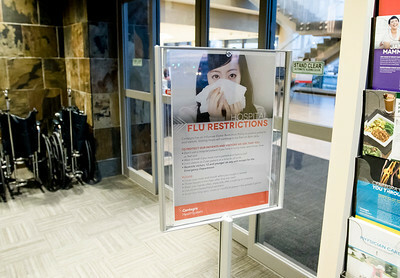 Sarah Nader - snader@shawmedia.com The Influenza Visitor Restriction Policy is posted at Centegra Hospital-Huntley to help protect patients and visitors Tuesday, Jan. 9, 2018. 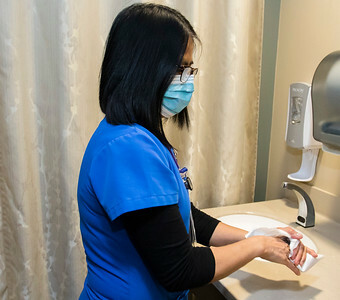 Sarah Nader - snader@shawmedia.com Registered nurse Carmelita Santos washes her hands and wears a face mask while treating a patient with the flu at Centegra Hospital-Huntley Tuesday, Jan. 9, 2018. The Influenza Visitor Restriction Policy is posted at Centegra Hospital-Huntley to help protect patients and visitors Tuesday, Jan. 9, 2018.